Isabel MacDonald Vibert Moffitt. Born in West Branch, Pictou County, Sept. 27, 1927, to Irving and Bertha (MacLeod) MacDonald. 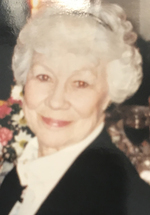 Isabel died surrounded by family in Halifax on June 18, 2018. Predeceased by her husband Dr. James C. Vibert, second husband Dr. Emerson Moffitt, brother Eugene MacDonald, and granddaughter Elizabeth Akerman. Isabel is survived by her five children, Marjorie (Bert Akerman), Ann (Glynis Ross), Jim (Kim MacDonald), Elizabeth (Todd Hatfield), and Mary (Doug Brown); grandchildren Katherine (Barry), Michael (Leslie), Will, Isaac, Emma, Jim, Bella, and Abe. She is survived by her stepchildren Eric Moffitt, Celene (Geoff Lyon), and Laurie (Michael Barr); and step-grandchildren Trevor, Barclay, Lee, Heather, and Vanessa. Isabel is also survived by her sister-in-law Betty Ashley (Oran), and many nieces and nephews. Isabel graduated as an RN from Moncton Hospital School of Nursing in 1948 and took further obstetrical training at the Royal Victoria Hospital in Montreal. A talented obstetrical nurse, in 1951, Isabel married Dr. Jim Vibert and they settled in Truro. Together they raised five children – Isabel efficiently and (generally) cheerfully tending a houseful of kids, volunteering in the community, and producing memorable meals while Jim was in the operating room. After Jim’s tragic death in 1977, Isabel raised the two youngest children on her own. In 1989, Isabel married long-time family friend, Emerson Moffitt. Issie and Moff enjoyed travels around the world and spending time with their many grandchildren. Isabel, also beloved as Issie and Nan, was the heart of a far-flung family, modelling and reminding us of the importance of family in our lives. Three generations regularly convene at Issie’s beloved cottage at the lake. Most recently Isabel’s children and many grandchildren gathered at her bedside for her 90th birthday. The family is deeply grateful to the staff of 3C, Northwood Centre, for the exceptional care they provided Isabel for nearly three years.